The Spectral Granular Synthesis techniques sequence spectra of grains extracted from a source file, and it uses spectrogram inversion techniques to reconstruct its phase. It enables extracting grains of larger/smaller size than the actual grain sequenced in the synthesis output. Indeed the spectrum of a single grain can be interpolated or decimated to match a different size but preserving the overall spectral characteristics (without shifting the pitch as in time domain resampling). This synthesis technique is implemented in MATLAB. 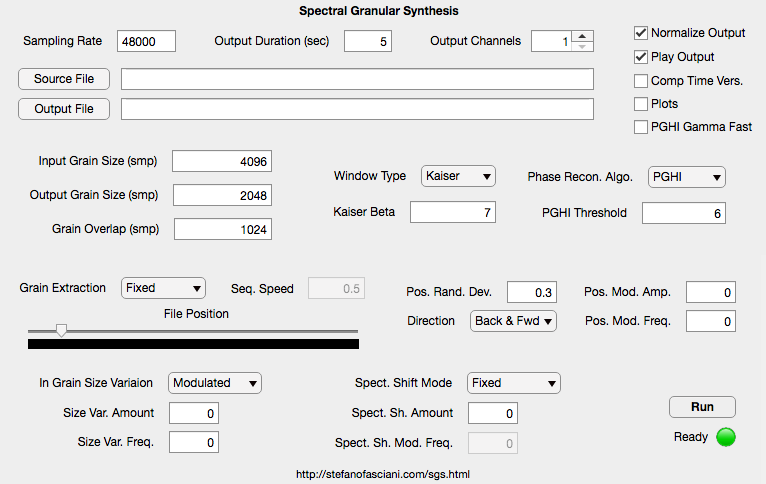 A GUI enables to control several synthesis parameters and options (refer to the documentation), including modulation/variation of grain size and circular shift fo the grains’ spectra. The implementation computes the synthesis output offline but it’s real-time ready, as it computes the output signal one grain at a time. For more information on the synthesis technique refer to the related publication. The six audio examples begin with the sound sample used for the Spectral Granular Synthesis, followed by few synthesis examples generated with different parameters (mono and stereo mode). Tagged computer music, dsp, granular, MATLAB, music technology, sound synthesis, spectral, spectrogram.